I was planning to make some plain muffins with just blueberries, and some with chocolate. However as I was mixing the batter I saw some passion fruit which needed to be eaten and thought passion! – the correct ingredient to add to the chocolate muffins. I liked the combination from eating them with pancakes as mentioned in a previous recipe. It turned out to be a good experiment. I used some fresh passion fruit and some from the Easiyo squirt packet, which is normally used to flavour yoghurt. 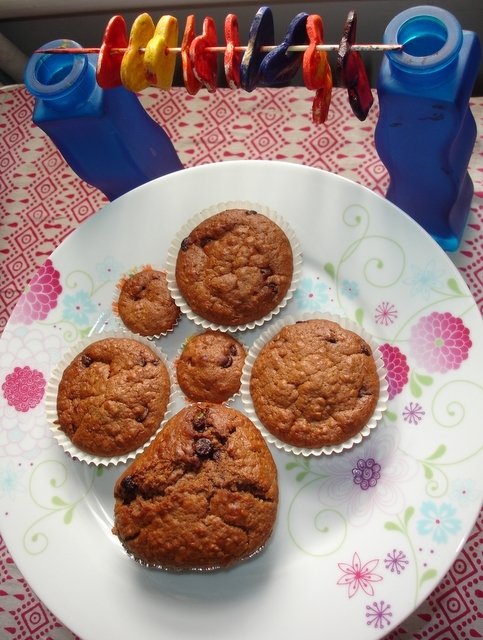 The taste of the fruit in the muffins was subtle but there were parts that had a very good tangy and sweet taste, with a little crunch from the seeds. So I guess my little experiment goes to show that you can add any kind of fruit, fresh, dried or jams to your taste, of course you may need to change the amount of sugar accordingly. In the past I’ve added blueberries, blackberries and cherries. To make them extra chocolatey I use coco powder as well as chocolate chips, however you can make them with just the chocolate chips if you do not want the intense coco hit. If you are using wholemeal flour then add 1/2 tsp of bicarbonate of soda. 1) Pre heat the oven to 200’C. Apart from the chocolate chips, mix all the dry ingredients in a large mixing bowl. 2) Add all the wet ingredients one at a time and mix well. Once mixed add the chocolate chips and mix again.